Breakfast – Rick and I went out to a diner! Yes, mid-week, which is highly unusual. We’ve been under a lot of pressure selling our rental house, money leaving our pockets faster than we can make it, working on a few client sites all at once, and then both of us got the flu. usually, I go to bed late, wake up late and shower and fly out the door. On Wednesday morning, I just wanted to relax a bit before rushing off to work. We went to a diner we hadn’t tried before. The only omelet choices had hash browns and toast with them. They also only had cheese, and I wanted to add grilled onions. I am NOT a morning person, and I had a difficult time conveying what I wanted. The cheese omelet special, add grilled onions. Hash browns also with onions, but to-go (for Rick’s next breakfast). No toast. Side of crispy bacon. This really perplexed the waitress. My meal came: a huge plate of cheese and onion omelet, with a giant portion of hash browns and toast and a side of bacon (that was “middling” crispy). SIGH. I ignored the hash browns and toast, and enjoyed the omelet and bacon. We probably won’t go back. There weren’t a lot of patrons, which is a sign that it isn’t a real popular breakfast spot. It seemed pricy and didn’t have a lot of options. However, my NYT crossword was completely finished in a half hour and I was relaxed and ready to greet the day. We had some running around and paperwork to attend to on lunch, so I had lunch out, too. This time, we went to Bigg Burger. You know, I’m not a real meat eater, but when you order a burger and the bun is gone, there isn’t much left on the plate. I was really really hungry (breakfast was at 7:30, and by now it was 2:30!). I ordered a TRIPLE cheeseburger, no bun. They have lots of free toppings to choose from, so I chose mayo, grilled onions, and grilled mushrooms. They served up a great-looking presentation and I was really full when done. (where’s the picture? I AM out of the blogging habit – I forgot!). Here’s a simulated picture. LOL. Wait, you KNOW I didn’t eat that bun! Since I took a long lunch, I didn’t get home from work until late. I was barely hungry after the “pounds” of meat I consumed at lunch, and also didn’t feel like cooking. I grabbed 4 thin sliced pieces of ham, put about 1 tbsp of cream cheese in the center of each and rolled them up. I tossed some chili lime almonds on the plate and called it a meal. For dessert, I had 2 squares of 70% chocolate with Smucker’s natural peanut butter on top. Yesterday was a typical day at work. I had yogurt for breakfast and a BLT for lunch. Okay, it was actually a bacon, spinach and tomato, so a BST. I made the sandwich in a low carb tortilla and add some mayo. It’s delish! I had some almonds for lunch. I stopped at Burger King on the way home from work, because we were going to be too busy to make dinner. Last night was pool opening night and my niece and her kids, plus daughter Cindy and the grandkids were all coming to help us take off the 27 foot cover. It went swimmingly! Anyway, back to BK. I ordered a double whopper with cheese, no ketchup and removed the bun. It was okay, and I was sated. Worked for me! I’m sure there are all kinds of hidden fillers in the meat, and other things that make this a less than perfect choice. However, I’ve learned to adapt to this keto plan and do the best I can. I guess there are easier ways to lose weight than being sick for 3 days, but it was a nice perk after a few disappointing days in bed on my VACATION. I came down with some type of respiratory infection accompanied with a raging fever on Sunday, was still sick in bed on Monday, and finally made it to the couch on Tuesday. Today was the first day I’ve actually felt like leaving the house or accomplishing anything. My food diary is pretty hit and miss. I ate nothing on Sunday. Rick made me eggs Monday morning, and brought me 3 meximelts from Taco Bell that evening. We both agreed that the keto plan could rest for a couple of days. Yesterday, I ate a yogurt, some almonds, and a Big Mac. I even tried to eat pierogis, but they had no taste. No matter what I ate, I only did it for the nourishment, because I didn’t enjoy the flavor of anything. This morning, I finally felt like getting up and out of the house. I wondered if going off keto for the past three days was countered by the fact that I ate very little, so I thought I’d check out the scale. A 6 pound loss! I know it’s water, but it’s encouraging. We’ll see what happens at Saturday’s weigh-in. Day 82: Cheat day. Boring. After a disappointing experience on the scale with a zero weight loss for the week, I decided to try to shake things up a bit. I had to work overtime on the book deadline for work, again. A final pdf is supposed to be at the the printer by Monday a.m. and it still needs work. I worked from my home office and skipped breakfast. 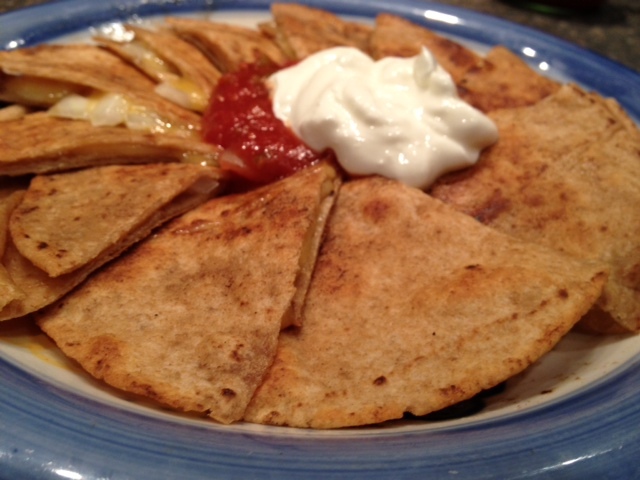 For lunch, I took a few minutes to heat my leftover half a quesadilla and topped it with salsa and sour cream. Rick and I were planning to have date night. I put away work for awhile, and we decided to go to the AUCE Chinese buffet for my cheat day dinner. I was very very disappointed. I tasted “old grease” on my crab rangoons, and the chicken that made up the General Tso’s chicken was all dark meat (which I hate). It felt strange eating rice for the first time in a couple of months, but it was no great shakes. All in all, I realized that the “fattening” no-carb foods I’ve been eating have mostly been fresh ingredients and very tasty dishes. This meal contained the “forbidden carbs” and they were not as great as I remembered. I was really lethargic and barely felt like getting up from the table. It was interesting to experience that feeling and gave me some perspective on how great I have been feeling without eating carbs. We went to see “21 Jump Street,” which was lame, but mildly funny. It was good escapism, and it took my mind off work, our business, home repair deadlines, and my dad’s issues. I decided NOT to get the snow-caps that I was planning to eat during the flick. If I felt this badly after rice and Chinese food sweeteners, how bad would I feel after a box of sugary chocolates? I was guessing pretty bad. The last cheat day I had, I didn’t really eat too badly. The carbs came from tortillas and cole slaw, not from these really starchy food items. I think that’s why I didn’t feel the effects as much last cheat day. I took a chance on 4 plain White Castle hamburgers after the movie, split some onion chips with Rick, and we each had their very tiny cheese cake dessert. That’s it! I’m back to low carb living. My walk on the wild side wasn’t all it was expected to be. I got to work at 8 and never had time for breakfast. To hold me over until my late lunch date, I had a handful of almonds. It was a beautiful sunny day, so Rick and I decided to meet for lunch and Checkers and eat outside. It’s only a little ways from work, so I walked down to meet him and we had a nice time outdoors for a bit. I ordered a Baconzilla with mayo and tossed away the bun. I worked until 6:30, then met my niece Marsha at the nursing home to visit my dad. The visit didn’t go too well, he was depressed and not too aware of what was going on. I didn’t get home until 8. Rick had thawed some chicken tenders for me, so I cut them into pieces and made some Indian butter chicken from the convenient package mix. I chopped up a half head of leftover cauliflower and micro’d it a couple of minutes to use as the rice base. I didn’t eat dinner until 10 pm, so I ate very little. I followed it with some chocolate mousse. I know it was way too late to eat, but I usually don’t get to bed until after 1 a.m., so it’s probably the equivalent of most people eating dinner at 6, then going to bed by 9 or 10 p.m. I did my day’s calculations and was way under on the carbs again. I also drank very little water. Time to get back on track with both of those goals today. Day 60: Bad weigh-in; time for a cheat day! Well, I certainly wasn’t expecting that! I’ve been carefully counting my carbs and I’ve been under all week. My clothes are getting looser and I feel great. Why oh why did I GAIN? I was actually UNDER carbs by about 6 yesterday, and probably didn’t drink enough water. I’ve been reading up on reasons for weight gain in keto, and I’ve found a lot about the importance of eating enough fat, avoiding being UNDER carb count, and drinking more water. I think it’s time for a re-set and a better effort. I’ve been avoiding it, but it’s time: I’m going on a cheat day today to see if I can get my metabolism moving. I’m also going to be sure to eat enough and drink more water in the coming week. If I’m going to work the keto plan, I need to do it right. On other diets, not eating as much as the allotted amount may work, but that hinders progress on keto (or so I’ve been reading, anyway). Yesterday started with my usual breakfast. 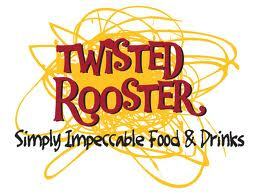 For lunch, we met George and Beccy at the Twisted Rooster. I ordered the Diablo burger, which was topped with pepper jack cheese, jalapeno bacon, hay stack onions, and a chipotle aioli. I removed the onions because they were breaded, and most of my sauce was stuck to them, so I asked for a small dish with more. I HOPE this aioli didn’t have any weird ingredients of sweeteners, but there was no way to find out. And, of course, I removed the bun, as well, and gave Rick my fries. The burger was good. the jalapeno bacon added quite a bit of flavor. After the bun and onions were removed, it didn’t look like much of a meal for $8, but it was quite filling – almost like eating a steak. The bad part about a meal like this is the unknown quantity of ingredients that will mess up my carb counth. Was the spicy burger filled with any kind of high-carb ingredient? What about the jalapeno bacon? Sounds safe, because bacon is a-okay, but who knows if there is some kind of hidden carb in it? I think I’m going to lay off the unknown menu items for a bit and stick to eating at home for the next week, where I know exactly what I’m eating. Later in the afternoon, I was working on websites and had a handful of almonds and a dish of sugar free jello. Rick felt a cold coming on and took a nap. 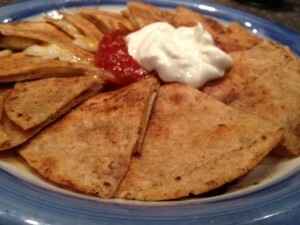 Around 8 pm, we were both hungry, so I made a late dinner of quesadillas using Mama Lupe’s tortillas. 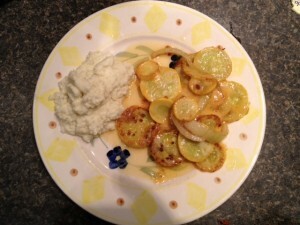 They turned out very well, and I was well under 20 grams of carbs for the daily count. Typical morning at work. It was busy as all get out and every time I started back to the kitchen to heat my eggs, I was interrupted. The result was I still hadn’t eaten by noon. Rick was coming by work to drop off the truck and ride his bike back home. I asked him to pick me up something for brunch, because the eggs had lost their luster. I check out Wendy’s online and lo and behold, they have some customization options. 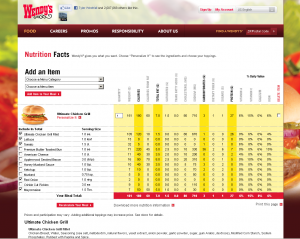 After selecting the item you want from the food menu, look for nutritional information. 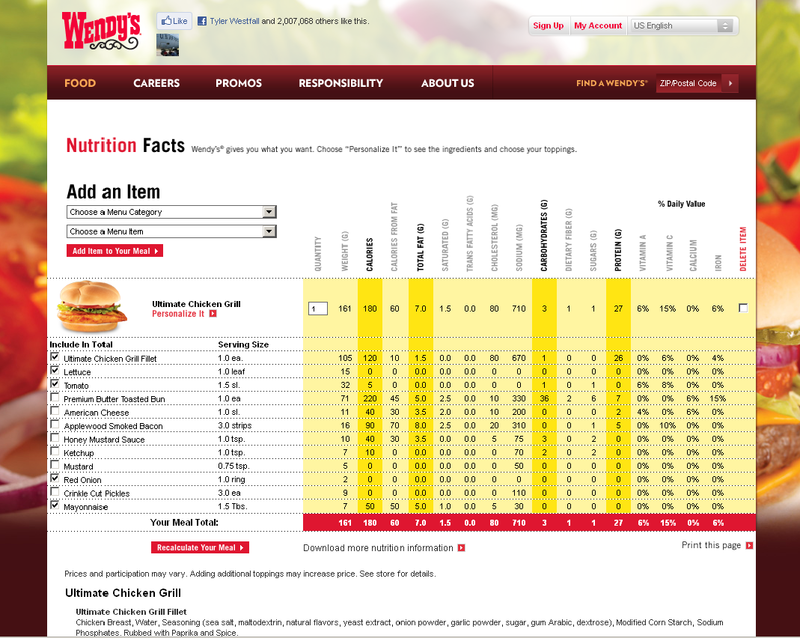 On that page, is a button that says “personalize it.” I was able to remove the bun and honey mustard sauce from the grilled chicken sandwich and see that the results made the meal only 3 grams of carbs. I personalized a side salad to go with it, and submitted my order to Rick, the carryout delivery guy. Rick picked up and delivered, and the results were very satisfying. Although I rarely eat there, I’ve always thought Wendy’s chicken breasts were very big and moist, and it was just as good without the bun. I was just happy to outsmart the fast-food carb monster once again. I had dinner plans with my friend Shelly. We met at Red Robin, where I had the guacamole cheeseburger again. This time, I didn’t ask for a lettuce bun. The concept was great, but the guac tends to smoosh around between the lettuce leaves. I opted for the side salad instead of bottomless fries again. As usual, they were tempting me from Shelly’s plate across the table. I ate about an inch off of the end of one. That was enough. As I contemplate what to add to a potential cheat day menu, steak fries become a great possibility. Those, and perhaps pasta, are the only things I can’t successfully replicate in a low-carb option. Yesterday was quite a trial. I slept late because I’m still feeling mighty poorly. I had to get my dad to the doctor by 11:30, and that was a very long trek due to hazardous roads. By the time I showered and got out the door, I didn’t have time for breakfast, so I grabbed a tall water and kept on moving. Wait, wait, wait, by 1 pm, I knew I was going to be trying to get my dad admitted thru the hospital ER (we were sent by his regular physician with suspected bronchitis). My stomach was begging for some nourishment, but no time. 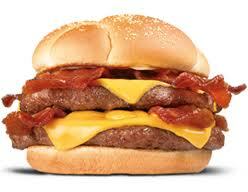 After I got him settled in an ER bed, my savior, Rick, ran out and got me a bacon cheeseburger with no bun. It did the trick…for a while. 6 pm and I was finally back at my keto-friendly kitchen. I wanted something FAST. I threw some butter in a pan, added a chopped up yellow summer squash and a slice of onion, then, when it was almost cooked, I threw in 2 tablespoons of coconut oil. I added some rewarmed cauliflower to the plate and it looked pretty impressive for a 5-minute meal. I grabbed some Greek yogurt with peanut butter and called it a night. Here’s hoping today is a little more “ordinary” and I can have some structured meal time.